Thomas was born in Bletchley about 1786 (as we see below his year of birth is not accurately indicated). His wife Elizabeth was born, perhaps in Greater Brickhill (near Bletchley) and perhaps about 1801 (again the census records are inconsistent with respect to age and in this case with respect to place of birth. 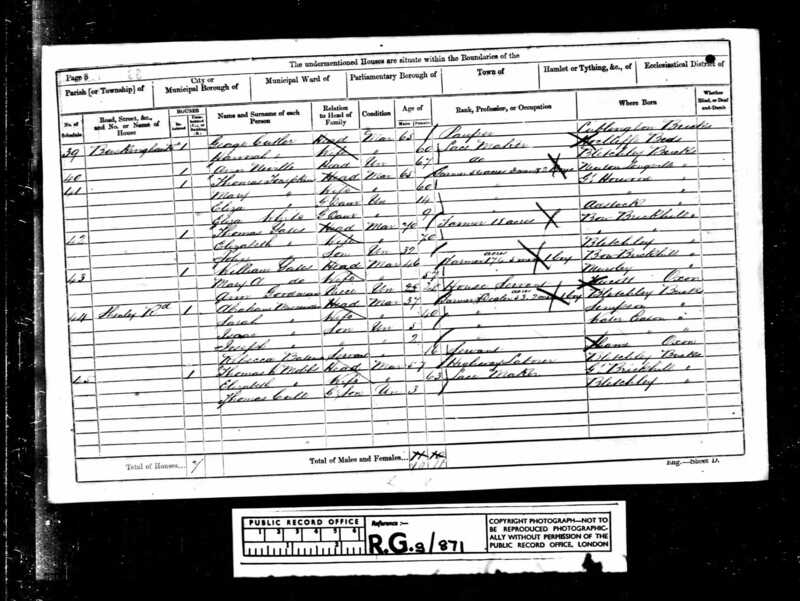 We located this census record, which allowed an initial determination of this previous Mobbs generation through the search for a George Mobbs, about age 12 in 1841 with a birth in Bletchley (to coincide with later census entries for George which provide this information as well as with family records transcribed by Gladys Hart who was married to a great grandson of George, John Hart). 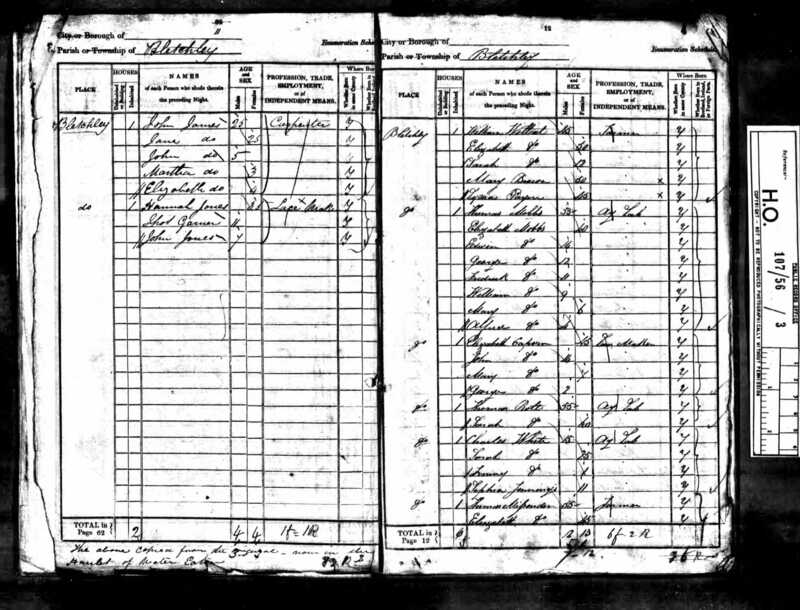 The information gathered in the 1851 census was more extensive than in 1841 and we thus gain some additional data on the family, although some inconsistencies arise. The family is still at Bletchley. We learn that Thomas has a middle name and is indicated as being Thomas Wood Mobs. The spelling without the second 'b' in the surname is used for his wife but the two children still living at home (George and Albert) have the name spelled with two 'b's. The information is written by the census taker. It is interesting he would have used two spellings in the same family. It is quite likely that the family was illiterate and would not have commented on such entries if they saw them. 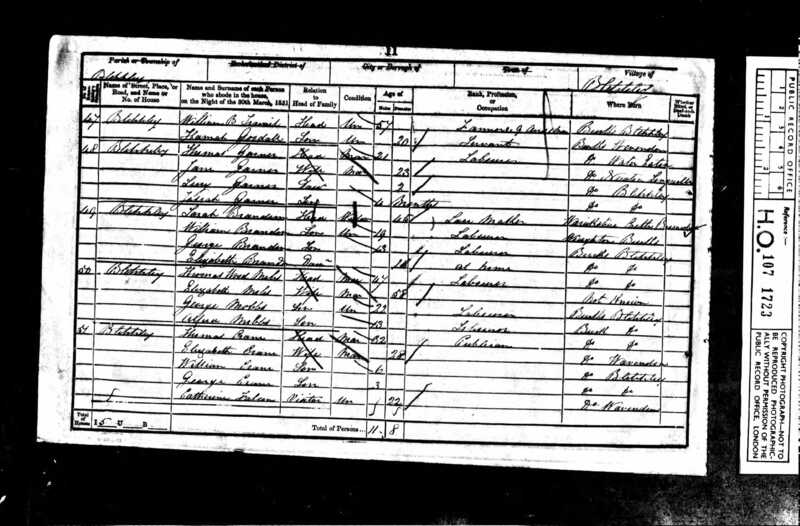 Interestingly ten years after the 1841 census, Thomas is now reported as being 67, rather than 65. On the other hand, Elizabeth who was reported as being 40 years old in 1841 is reported as being 58 ten years later. (as the youngest child, Albert is 13 this would mean she bore him at the age of 45 -- not impossible but also not likely). This would indicate a birth year of 1784 rather than 1786. Thomas and the children are indicated as having a Bletchley birthplace, but for Elizabeth it is stated that her birthplace is 'not known'. Thomas is listed as being a labourer as are both the sons. Ten years on and we find Thomas and Elizabeth living at Greater Brickhill, Buckingham, about four miles southeast of Bletchley. Thomas is now reported as being 67 years old (the same as a decade earlier). Elizabeth is now listed as being 63, which would make her five years older than ten years previously. I wonder if they reported younger ages related to their employment? Thomas is a highway labourer and she is a lace maker. We now see that Elizabeth reports she was born in Greater Brickhill. We see on this page that Mary Wood Mobbs has married in the third quarter of 1852. The middle name Wood is new, however, we note that Mary's father Thomas also has a middle name of Wood so this certainly gives us a high probability of certainty. Additionally, we see that Francis Cull is listed on the same page so it would appear that this is the marriage we are looking for.